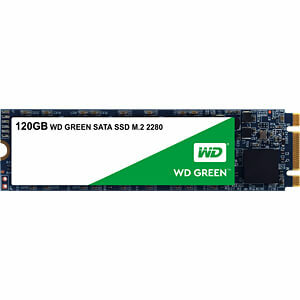 WD Green SSDs can be used in laptops and desktop PCs and offer the high levels of performance and reliability that you need for working on your computer every day. With comprehensive WD F.I.T. 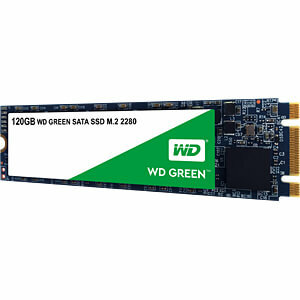 Lab certification testing, and available as 2.5"/7-mm cased or M.2 2280 models, WD Green solid state drives are compatible with most PCs. The free WD SSD Dashboard lets you monitor your storage. SLC (Single Level Cell) caching increases the write speed and speeds up everyday tasks. Shock resistant and with WD F.I.T. Lab certification for compatibility and reliability. Extremely low power consumption means a longer battery life for the laptop. Available in 2.5-inch/7-mm cased and M.2 2280 models, making it suitable for most PCs. Free downloadable WD SSD Dashboard for easy status monitoring.